If you found your way to this article expecting me to share my favorite streams, or any streams that I fish, then just go ahead and click somewhere else now. 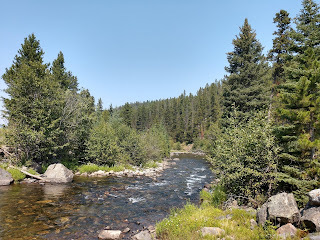 The title may be a little misleading but actually not by much, what I hope to do is to explain how I find the places I fish and hopefully help you to find the best trout streams in your area. The easiest and first thing to do when looking for a new place to fish is a simple google search. Just like this article, don't expect any trout whisperers to divulge their super secret fishing holes on the open web. With a few exceptions most of the time with an internet search you will get magazine articles and recommendations of general areas, not specifics. 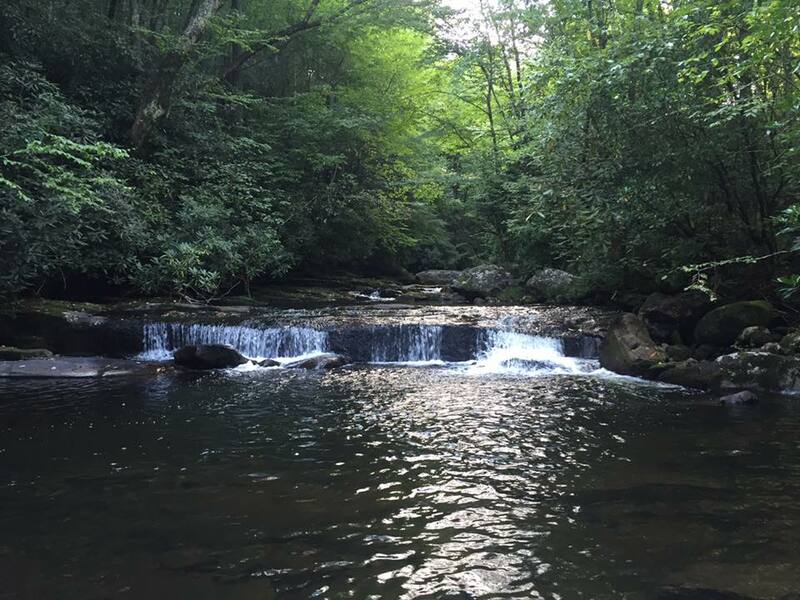 If there are specific directions then 9 times out of 10 it is to the streams that are the most advertised and get the most fishing pressure. If you want the out of the way places and the places where you are not likely to see many others fishing you have to dig a bit deeper. One of the best tools I have found for finding great fishing, that is available to virtually everyone for free, is Google Maps. 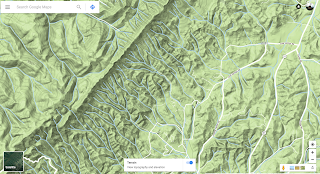 Bluelining, searching out remote blue lines on a map for fishing, is a hobby unto itself and Google Maps makes it easy. I use the terrain overlay, as you can see in the screenshot to the right, so that I can get an idea of how steep and rugged an area I am interested in is. Pick a likely looking blue line, most of the time a tributary to a more well known stream, then do a little google searching for that stream and lastly actually go and check it out on the ground. Bear in mind that this is a little like prospecting for gold and 90% or more streams end up to be busts, but when you do find a good stream it can be real good, one of those truly secret spots. One of the things that google maps is not good at is showing private property, posted land, houses and buildings. Looking at the screenshot above it looks as if that area is all national forest and open to explore. If you cross reference with google earth or satellite imagery then you can see that is not the case and there are houses and buildings and very likely posted land that you can only see when you go look in person. 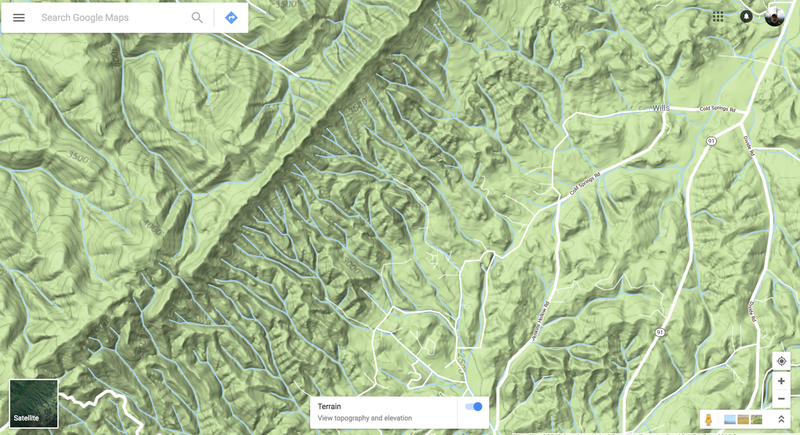 A good tip is to try to find areas with no roads as these will likely, I say likely because a lot of unimproved roads do not show up on Google Maps, be remote areas and a good place to explore. Another great resource is internet fishing forums such as this one, The North American Fly Fishing Forum. There are many regional forums and the larger ones, like the one in the link, have regional sub forums that are full of really good information. Again, more than likely no one is going to give out specifics, but there is still a lot of very valuable info available. 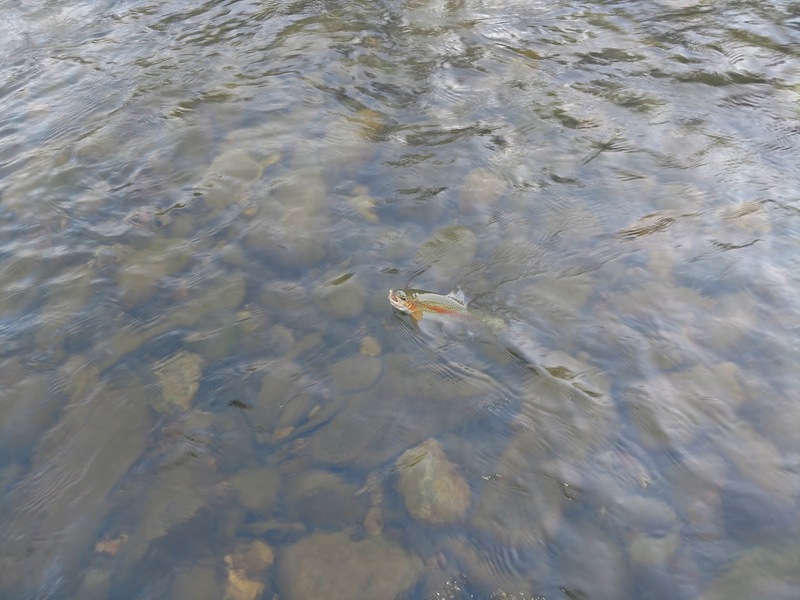 What is hatching, trip reports, fished out streams and much more. One thing about forums is that each one has it's own particular personality and values. Some can get pretty opinionated and often times downright nasty if you don't follow the majority's view points. But with that said, still a gold mine of info on many different topics, fly fishing streams included. Lastly, and perhaps obviously, guide services and fly shops. These, like the forums, vary widely as to how helpful they are. I was in Montana this last September and North Forty Fly Shop in Great Falls Montana was fantastic. With good info on places to fish, current local stream reports and what flies were hot, fantastic service all the way around. Conversely, me and a good friend went fishing near Blowing Rock NC over the Thanksgiving holiday. 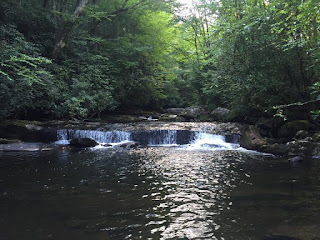 We explored the entire length, from where they enter the Watauga River to the headwaters to small to fish, of two streams recommended to us by a local shop. We could not find a single access point, or really any stretch of stream that did not run through someone's front yard. I am sure that if we would have paid for a guided trip then things would have been completely different. Which segues perfectly into the final option, paid guided trips. If you are traveling to an unfamiliar place and have limited time then a guided trip is more than likely your best bet for getting in some good fishing. These guys are professionals and their livelihood depends on being able to get customers on fish. I am by no means an expert but I suggest reading a ton of reviews and researching guides before booking. I have heard a lot of trip of a lifetime reports as well as real horror stories. Depending on where you live, good fishing areas can be hard to find but in my opinion the entire process is extremely rewarding. 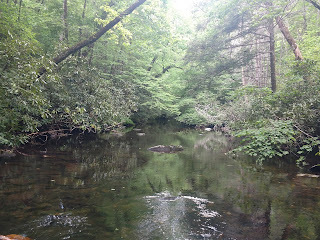 It takes time and sometimes some hard miles busting laurel thickets but the end result just may be your own secret fishing spot.